NEWLY REDUCED PRICE – MUST SELL – THIS BOAT HAS BEEN STORED INDOORS SINCE 2007 RE-POWER – less than 40 hours running time on engine & out-drive new out of crate. 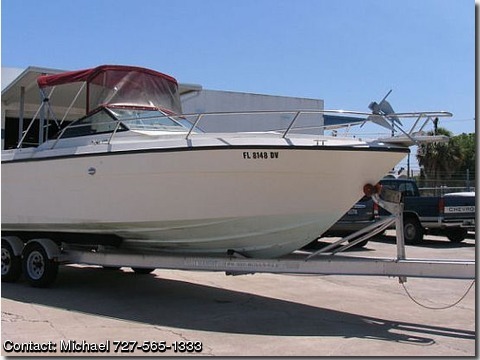 Original Cat Limbo 25' deep V sportfisherman, 27'+ overall with bow pultpit and dive platform. Excellent condition, extremely solid, fast, dry and seaworthy offshore boat, completely re-powered in 2007 from props to tank, new outdrive, engine, auxilliaries, batteries. High-performance 383 Merc with BravoIII dual prop outdrive. 120 gal tank gives over 360 mile range in fair conditions. Separate fore and aft bilges with 2 bilge pumps, vhf radio, compass, depth/fish finder, SS wheel. Large basic v-berth with storage, sleeps 2 comfortably. Cockpit has large built-in ice/food chest, plus huge fish box. Live bait well on full stern dive platform. Bow pultpit with SS railing, chain locker, 2 anchors. Bimini with windscreen, full storage cover. 2 axle Rolls trailer, excellent condition. Note: I am often out of the country. Call the 565-1333 number first. It will reach me anywhere.